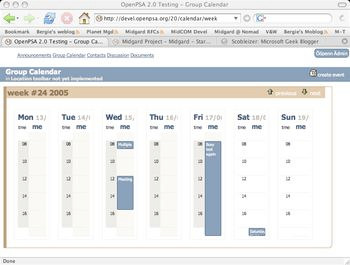 There are several places in OpenPsa where persons are displayed in some list: Search results, campaigns, buddy lists, project participants, etc. To make them more informative, I’ve now implemented a contact widget library that can be used anywhere in MidCOM. The nice part about this is that the output is in the hCard microformat, enabling it to be machine-readable, and easily converted into vCards. In addition to hCard support, the widget has also integrated support for photos from Gravatar and Jabber instant messaging presence from Edgar. The Edgar server can also be installed and used locally. Other ideas I’ve had include blog RSS integration. Updated 2005-08-02: This is now documented and maintained in the Midgard Wiki. 04 August 2006. 1 minute read. OpenPsa2 source code has now been moved to the Subversion repository used by MidCOM. Since OpenPsa is now a pure MidCOM component system this should aid in cross-project collaboration.